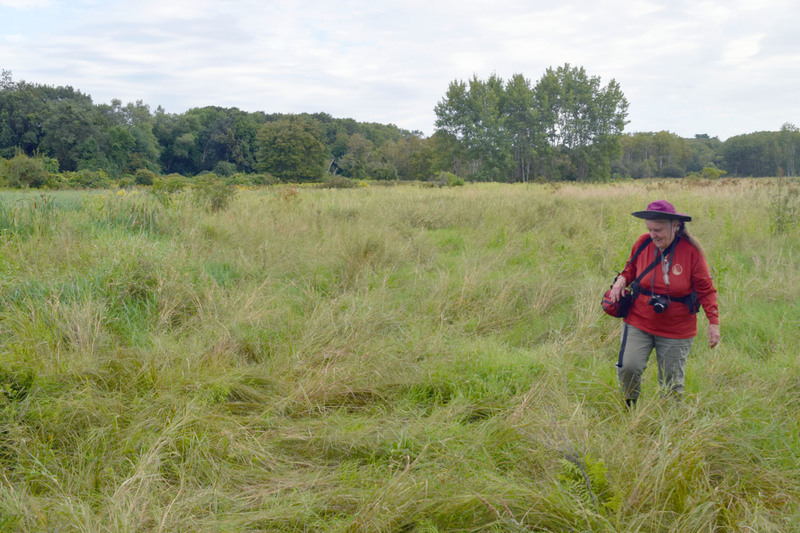 Here’s a portion of Fowl Meadow, the Neponset’s 8-mile-long floodplain, just off Meadow Road in Readville. 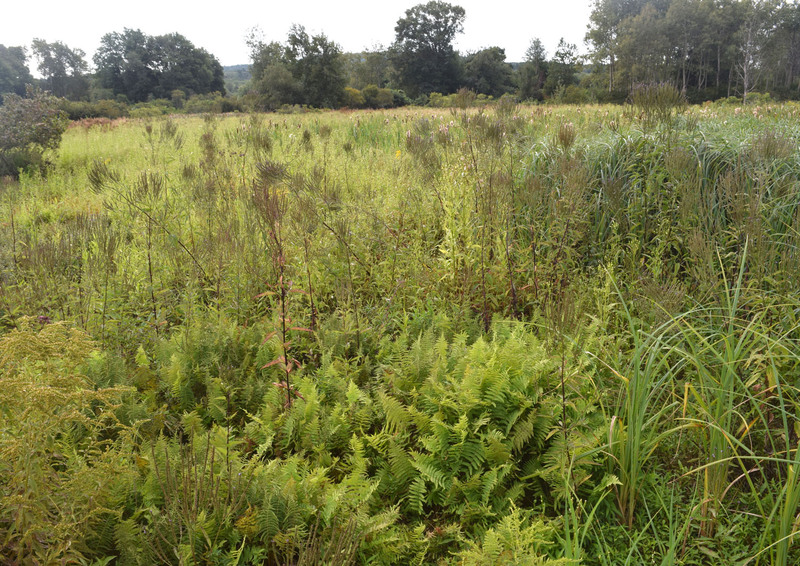 Not all of the Meadow is grassy–a lot is forested, maybe even more is shrubby–but this part is open, with Blue Hill behind the tree-lined levee at rear. I was there in September with NepRWA board member Martha McDonough to look at possible routes for a boardwalk. 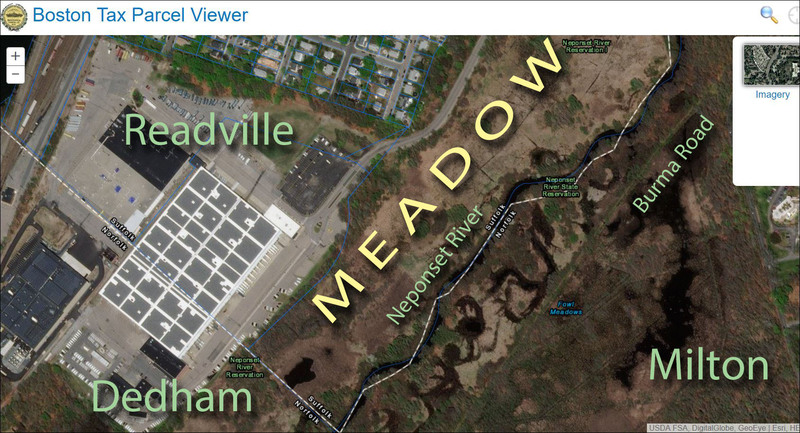 All of the Meadow in Readville is public parkland, part of DCR’s Neponset River Reservation, and it supports one of the few intact freshwater wetlands in Boston’s city limits. It’s this wetness, along with occasional fires, that prevents trees from coming in wholesale, and keeps the Meadow a meadow. 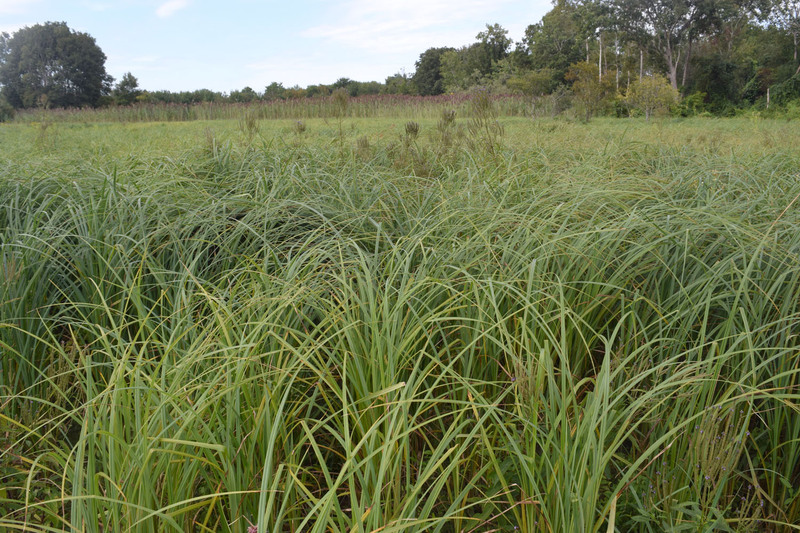 The marshy parts aren’t always grassy, technically speading–the long-bladed patch-forming plant above is lake sedge, Carex lacustris. Far off behind it is a wall of taller phragmites. Late summer is typically the driest part of the year, and we were able to walk through here without much trouble. A little further on, however, we ran into some cattail, seen above with fireweed and smartweed, and started to squelch a little underfoot. In back you can see the ratty wooded thicket along Meadow Road, a favorite target for dumpers. Here’s Martha in a patch of actual grass, mostly I think bluejoint (Calamagrostis canadensis). You can’t see the wobbly tufts below, which made it sketchy to walk through. Most of the Fowl Meadow is like that: borderline walkable. If you don’t have a road or fill embankment or whatever, you had better suit up. 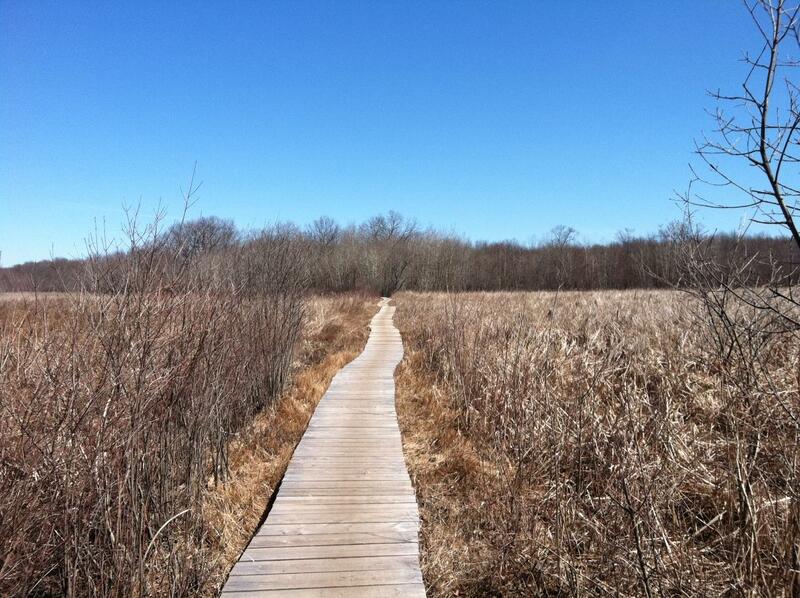 Here’s a boardwalk in the Charles River floodplain in Needham, part of a popular DCR trail along the river (photo courtesy of a trail runner’s blog). Would something like this work in Readville? I think I agree with Martha that the Meadow is just too good to be missed. 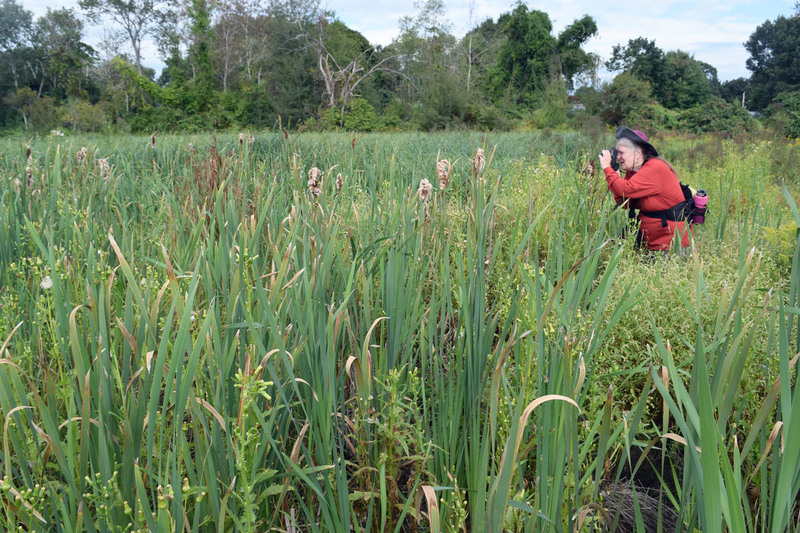 Read how Fowl Meadow protects Boston from flooding.